Awhile back, this poster appeared on Facebook, and some questioned the “religion without sacrifice” phrase. 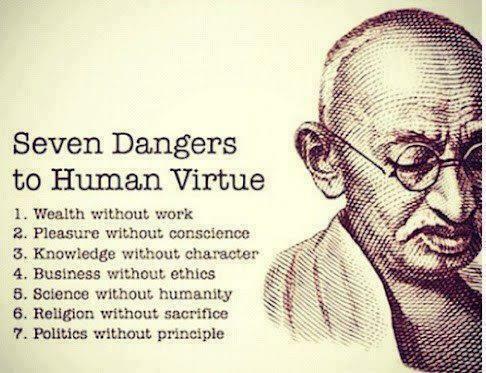 I think that this sentence is a good restatement of Gandhi’s “religion without sacrifice” being a danger to human virtue. It fits with my understanding of the Hero’s Journey, the path of initiation, in that once the first threshold is passed, the tests and trials begin. Once a person realizes that there is more to life than what meets the eye (and the other senses) that initial experience is followed by a cellular reaction as the body tries to adjust to the new reality. That reaction can be painful. Change does not come easily—there is always a price. Today, being Good Friday, is a good day to reflect on this—this season of the Spring Equinox—when the juice is ramped up and all the circuit breakers of our being start to heat up. Current + Resistance = Heat. Sacrifice sound so painful with much ego implications; replace the word sacrifice with Surrender, would be an interesting replacement. Surrender implies alignment, a change of vibration, the establishing a different rhythm, and the following the beat of a different drummer. Thanks for a timely post, Michael. Sacrifice is a rare commodity, most commonly mistaken to mean the destruction of another human or their happiness and prosperity in the name of ‘the greater good’ or placating an angry god be it religious or political. Sacrifice is deeply personal and might be putting aside what I want at the moment (good or no) to accommodate the need of another living being.